The dress you walk down the aisle in holds so many memories — not just of the wedding itself, but of the planning, the dreaming, the anticipation. You may never wear the dress again, but it just feels wrong to stick it on a hanger in the back of your closet. Your own child may want to wear it someday, or perhaps you just want to preserve it to help hold on to the energy of that special day. 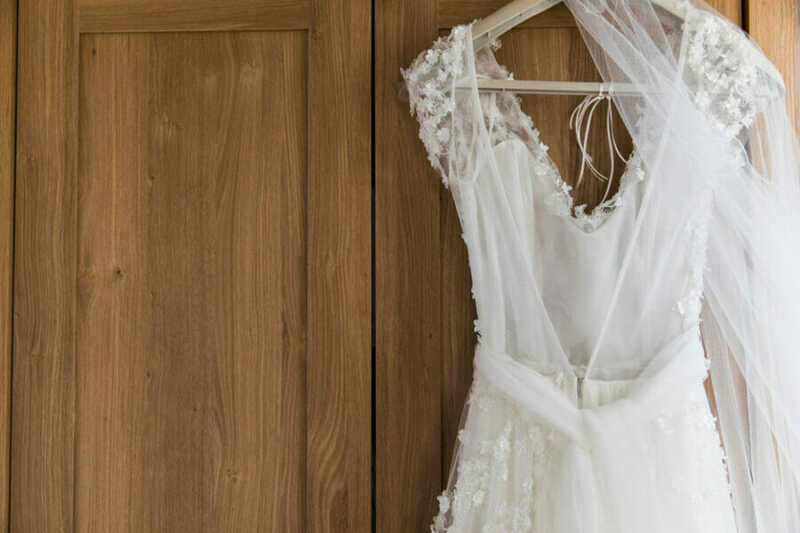 Wedding dresses are also typically a substantial investment, so storing them correctly is key unless you want to end up with a yellowed, creased, or — perish the thought — moldy mess on your hands. Here are some tips for preserving your wedding gown after the champagne’s been sipped and the thank-you notes sent. Budget for it. When you are doing your wedding budget, build in enough for wedding dress preservation. 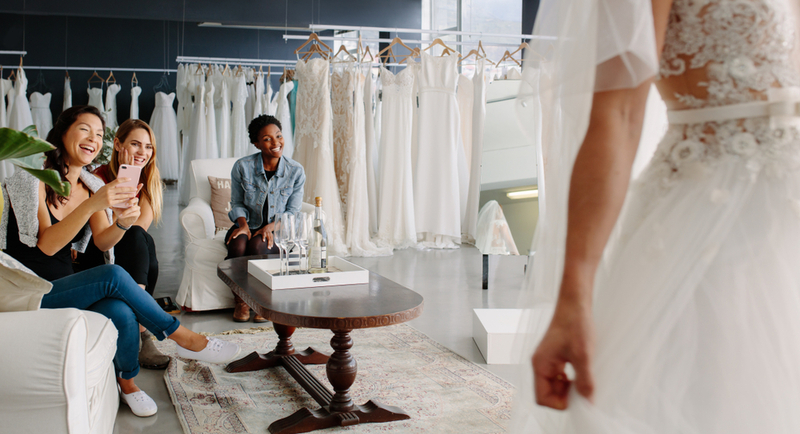 Whether you have a professional preserve the dress for you, or you get the dress professionally cleaned and then undertake preservation yourself, you’ll need to plan for the cost. Preservation kits range from around $200 to over $700, with full-service professional preservation being even more. Don’t wait to get your dress preserved. Stains and smells can set in quickly. Get your dress cleaned and preserved as soon as you can — the day after the reception, if you can. If you can’t get right to the preservation process because you’re off on your honeymoon, do your research ahead of time and entrust the dress and the task to someone you trust. Have the dress professionally cleaned. Even if there’s no visible dirt or stains on the dress, have it cleaned. Your body oils and sweat are trapped in the fabric. Storing a dress that hasn’t been cleaned first is a recipe for smells, yellowing, and mold or mildew down the line. Be sure to choose a cleaner who offers wedding dress preservation specifically — a regular dry clean won’t do. Also check the label on your gown in case there are certain solvents or products it can’t be cleaned with. Choose your preservation container. You can’t just use a regular old box or garment bag. Some brides choose a wedding dress preservation box, which is made of acid-free paper and is airtight. Others choose a special garment bag made of acid-free plastic. Box it up. If you’re choosing to use a dress preservation box, wrap your dress carefully in acid-free white tissue paper or unbleached muslin that has been washed and dried. Colored tissue paper carries a risk of leaving stains on the dress. Place tissue or muslin between the folded layers of the dress as well. If your dress has sleeves, fill these with tissue or muslin too. Once the box is sealed, it is airtight — if you open the box for any reason, you’ll need to have it professionally resealed. Hang it up. If you choose the acid-free plastic garment bag route, choose your hanger carefully. Use a padded hanger, not one made of wire, wood, or plastic. These materials can snag the dress as it hangs. Hanging allows for great air circulation and avoids the creasing that comes with using a storage box. Leave it in the dark. Light is the enemy of wedding dresses. Store your dress, in its box or bag, in a dark place where no direct light can reach it. Direct sunlight is especially dangerous. Sunlight can quickly yellow the dress. Keep it cool and dry. In addition to being dark, the place where you keep your preserved wedding dress should be cool and dry. Fluctuations in temperature or extreme temperatures can break down the fabric even within the box or bag. Attics, basements, and garages are not good choices for storing a preserved gown. You want a cool, dry, dark, and climate-controlled space. Some brides choose a wedding chest, but any closet or storage unit that meets the criteria is fine too.